are you an intensely ambitious percussionist hungry for better snare drum chops? go wrong (and usually does)? sometimes just want to quit? the snarehacker formula: spring boot camp is for motivated percussionists who want to transform their snare drum playing. it's 10 weeks of high-level technical training and intensive repertoire study. you’ll build a complete snare drum practicing system, from your daily technique workout to your long-term repertoire study. 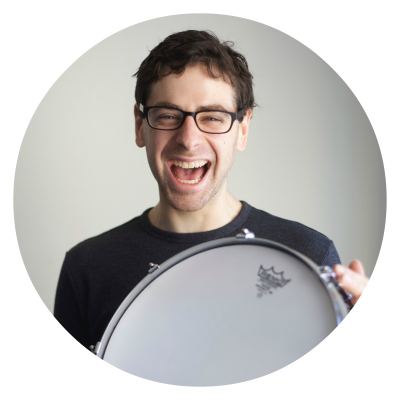 it’s the exact system that i developed to build snare drum chops over more than a decade, and it helped me overcome uncontrollable shaking and my fear of the snare drum to get into juilliard, the new world symphony, and the metropolitan opera. where you know exactly what to do every minute of every practice session to make the most rapid progress possible. where the exercises you choose to play are actually working, and every single aspect of your snare drum technique is improving. your 4-stroke ruffs are becoming crisp, precise, and consistent. i don’t want you to have to experience your hands shaking when you’re playing soft excerpts, like i did for so many years. i don’t want you to feel like your snare drum technique is a weakness and is holding you back from taking the next step in your career. build a daily technique workout that methodically expands your technique? learn to play delécluse with the precision and musicality of someone far beyond your abilities? build a repertoire of excerpts? master the art of writing the perfect exercise to target your current biggest obstacles? develop a set of personalized grips that are ideal for each type of snare drum playing? make more rapid improvement than you ever thought possible? 2) put you on the path to becoming an elite snare drummer. the work you do today builds the foundation for your future. you’ll thank yourself for doing this 5 years from now. …don’t you wish you had a fully-prepared plan that actually works? i'm a percussionist in the metropolitan opera orchestra in new york, i'm the founder of the percussionhacker youtube channel, and i've taught hundreds of students how to practice snare drum and prepare for auditions. i’ll take requests from the class to do special extra sessions on topics such as choosing gear, tuning snare drums, time and rhythm, or anything else you are interested in learning during this time. class times will be on thursdays at 3pm eastern. if that doesn’t work for you, let us know at hello@robknopper.com and we will try to make an accommodation. "i have been playing snare drum for over 55 years. i studied with buster bailey many years ago. he was a great teacher and performer and i was very content to play the way he taught for the rest of my life. several years ago i became convinced of the benefits of playing with matched grip, and worked to change. i had a fair level of success, but felt as though i had hit a brick wall. rob's course gave me the tools to reach my goals and bring my left hand to a point equal to my right. with each session lasting about 60 - 90 minutes. the 21 variables of grip and stroke: learn the core elements that make up every note on the snare drum. these are your new ‘rudiments’ and what will constitute the encyclopedic vocabulary of your new snare drum technique. immaculate, hand-to-hand singles: the foundational exercise of your new warmup will develop immaculate, even hand-to-hand single strokes and integrate the variables of tension, touch, and dynamic. learn to muscle-memorize an excerpt: learn to use the ROAM method to go through a piece, note-by-note, to sculpt and muscle-memorize it. we’ll also talk about how to choose stickings and your homework will be prokofiev 5, mvt. III. machine-gun doubles and ruffs: learn how to master the secret to great ruffs: a louder second bounce, while developing even, matched hands and a machine-gun double stroke roll. integrate the variables of width, shape, and dynamic. your first transition progressive exercise: master the immediate shift from singles grip to doubles grip and develop your first compound grip. your homework is scheherazade mvt. III, D-E.
silky-smooth, flexible, strong buzzes: learn how to develop smooth, flexible buzzes that can be molded into a roll of any length or volume. develop your soft roll and loud roll grips, while matching hands, building a silky smooth snare drum roll, and integrating the variables of density, shape, and dynamic. the third and final transition progressive exercise: complete the process of building your daily practice system by mastering the last remaining immediate shift: doubles grip to buzz grip (and back). "i feel 100 times more confident in my snare roll. by working on controlling the variables that surround a roll, breaking them down completely and rebuilding them, i have gained confidence in my ability to create a musically efficacious roll." + what's the weekly time committment? + is this geared towards orchestra players or does it work for any percussionists? although i developed my process with the express purpose of winning an orchestra job, at its core it’s a snare drum technique system for any type of playing. it will help you develop the techniques, grips, and repertoire that you decide are most important. if you hate it, return it. i’ll give you 30 days to make up your mind. if you start going through the information and you decide that this is totally wrong for you then just let me know within 30 days of your purchase, and i’ll refund your entire payment. nope - just a computer with internet. and sometimes i’ll ask you to record yourself playing and upload it. use the best audio and video equipment you have access to but you don’t need to buy anything new. nope! there will be a variety of ages in the class which is great because it will make the types of questions and issues we cover broader and more universal.